The chronic obstructive pulmonary disease, or simply COPD is a term used for a group of lungs diseases characterized by chronic obstruction of the airways within the lungs. Within this group, two diseases stand out as being responsible for almost all cases of COPD in clinical practice: chronic bronchitis and pulmonary emphysema. To understand what chronic obstructive pulmonary disease is, it's first necessary to have basic knowledge of anatomy and functions of the lungs. 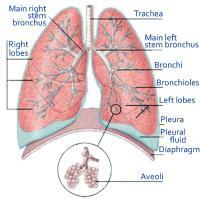 When we breathe, air enters through our upper airways and reaches trachea. 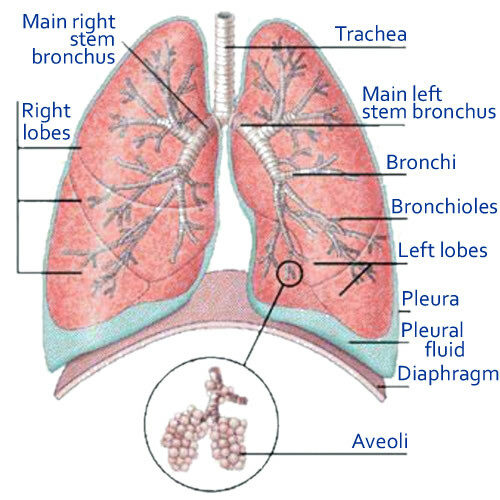 It bifurcates, forming the main bronchi, each moving toward a lung. As they advance into the lungs, the bronchial branch divides into smaller segments called bronchiole which in turn terminate in the alveoli. The alveoli are microstructures in the form of bags, highly vascularized, responsible for gas exchange. The blood that reaches the alveoli delivers oxygen and returns carbon dioxide to be exhaled in the breath. Chronic obstructive pulmonary disease is characterized by a limitation of airflow within the airways of the lungs, particularly during exhalation. The air can enter, but has trouble getting out, getting stuck in the lungs. This air trapping occurs by the destruction of lungs tissue and loss of elasticity of the bronchioles and alveoli, which eventually collapse during the expiratory phase of the respiratory cycle. The destruction of the bronchioles and alveoli is also responsible for the loss of lungs capacity to perform gas exchange, causing the patient be unable neither to breathe oxygen, nor adequately breathe carbon dioxide (CO2) out. COPD is usually a progressive disease caused by an abnormal inflammatory response of lungs tissue after chronic exposure to noxious particles or gases, such as smoking, for example. 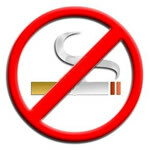 About 20% of smokers develop COPD. Other rarer causes of COPD include genetic diseases such as alpha-1 antitrypsin deficiency, chronic exposure to toxic dust as in the case of coal mining, welding fumes or smoke from fire. Unlike the common frames of asthma, which obstruction exists only during periods of crisis, the obstruction of COPD is constant and irreversible. Bronchitis is a term that means inflammation of the bronchi. In asthma bronchitis is acute and reversible. In COPD it is chronic and permanent. However, it is very common these patients have episodes of asthma superimposed on the disease, i.e., an acute bronchitis over a picture of chronic bronchitis. In chronic bronchitis the pulmonary lesion is located in the bronchi and bronchioles, making them chronically inflamed, and constant thick mucus production. The patient with chronic bronchitis has in addition to symptoms of breathlessness and fatigue a chronic cough with phlegm. 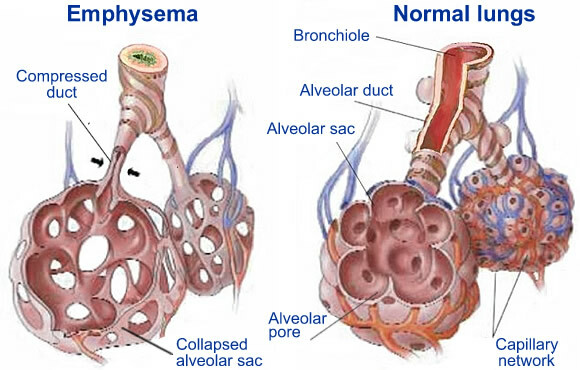 Emphysema is characterized by destruction and enlargement of the terminal bronchioles and alveoli lose their elasticity and favor the entrapment of air within the lungs. In emphysema a sustained hyperinflation of the lungs is noticed as air never goes out completely. In clinical practice we encounter, in fact, an overlap between the two diseases. The patient with COPD may have symptoms of chronic bronchitis, but always presents some degree of destruction of the alveoli and hyperinflation. The same occurs in emphysema, which usually has some degree of mucus production and chronic cough. Therefore, the term COPD is best to define the disease in these patients. 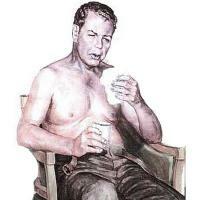 Most patients who develop COPD have a long history of smoking at least one pack of cigarettes a day for 20 years. The disease usually begins to manifest itself after 40 years of age. The first noticeable symptom is usually morning cough with sputum. However, a sign that usually go unnoticed by patients and their families is the progressive inactivity. Due to fatigue and shortness of breath the patient begins to limit their daily activities, to the point where, after a few years, the disease is so advanced that even at rest they feel tired and lacking air. Because COPD affects older people, tiredness and shortness of breath on exertion is usually attributed to aging and smoking, and does not initially arouse much attention. As the disease progresses, the cough and expectoration become more frequent. The lack of air becomes limited. The mucus production and destruction of lungs tissues favor the emergence of infections such as pneumonia. The bronchospasm (wheezing) occurs frequently. Depending on the predominant type of COPD (chronic bronchitis or emphysema), the patient usually has two different appearances. 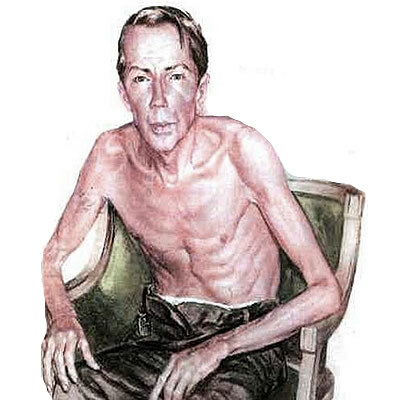 The emphysema is very thin, malnourished, with increased rib cage, called a barrel chest. It is important for a patient with lungs hyperinflation as it is difficult to put out the air, you breathe as if you are blowing. The chronic bronchitic tends to be more obese, cyanotic (purplish skin tone due to lack of oxygenation), with frequent coughing, large phlegm production. Again, remember that we are talking about extremes of a spectrum of clinical manifestations that can occur in COPD. Most patients have a bit of each of the symptoms above. As COPD destroys lungs tissue and impedes the elimination of air breathed in addition to hyperinflation, air bubbles begin to form within the lungs, which can easily be identified on chest radiography or computed tomography (CT) of the lungs, as indicated in blue arrows below. Another useful test in the evaluation of COPD is an arterial blood sample, a simple analysis of arterial blood that supplies the values of circulating oxygen and carbon dioxide (CO2). As mentioned above, patients with COPD have low oxygen and high CO2 retention. 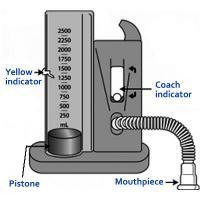 But the best test for the diagnosis of COPD is spirometry, also called pulmonary function tests. In this test, the patient breathes through a small tube as a computer records various respiratory parameters used for the diagnosis of lungs disease. Spirometry can detect COPD in early stages, even before patients notice symptoms. There is no cure for COPD, it usually is a progressive disease and is fatal in advanced cases. Therefore, although there is treatment to slow its progression, the only really effective approach is prevention, i.e., NO SMOKING. Once the patient has COPD, the single factor that most helps slow the disease is to stop smoking immediately. The pharmacological therapy mainly aims to alleviate the symptoms and improve the quality of life. Inhalational bronchodilators as salbuterol, formoterol, tiotropium and ipratropium, among others, can help reduce the obstruction of bronchi temporarily facilitating the flow of air into the airway. During periods of the disease exacerbation, as there is great inflammation of the airways, taking corticosteroids orally or intravenously for a few days is important in helping to reverse the crisis. Out of the crisis corticosteroids are only indicated in cases with poor response to bronchodilators, and yet are administered only by inhalation. When exacerbations are caused by infections, antibiotic use is essential. The vaccination against influenza and pneumococcus (bacterium that causes pneumonia) is important to reduce the incidence of respiratory complications. Pulmonary rehabilitation exercises are important for improving the quality of life and reduce the number of hospitalizations. In more advanced cases, when the patient already has a persistent hypoxemia (low blood oxygen), the use of supplemental oxygen is indicated. The amount and period in which the patient must stay with supplemental oxygen is a medical decision and can only be shown while sleeping, or during continuous efforts in severe cases. Patients with COPD should avoid air travel without medical consent due to low oxygen concentration inside the cabins. In these cases the use of oxygen may be necessary even for those, who not have hypoxemia at sea level. When the air bubbles become very large and are to compress the lungs, a surgery may be indicated to remove them. Terminal cases can be treated with lungs transplantation, if the patient has medical conditions to do so. Red Meat Really Cause Cancer? In the article you write about lungs transplantation. To tell the truth, I have never heard about it. Where can this operation be done and is there any age limit for doing such an operation? If anybody heard about this, can you inform me? Recently I always have tickles in my throat and cough with secretion of mucus. After coughing it stops tickling, but it doesn't stop for long. If I don't cough, I am short of breath. What should I do? I suffer from asthma. Each year I can not choose a place for rest and treatment for asthmatics!If you know places, that are not very expensive, can you share experiences and results? Linda, huff instead of cough and bend over while sitting and reach out forward and blow out really hard. This position allow more air to escape your lung that maybe trapped.